I’ve been thinking lately how I want to swap out all our fake plants in the house for real plants but was worried because we didn’t have many sunny spots to set them. 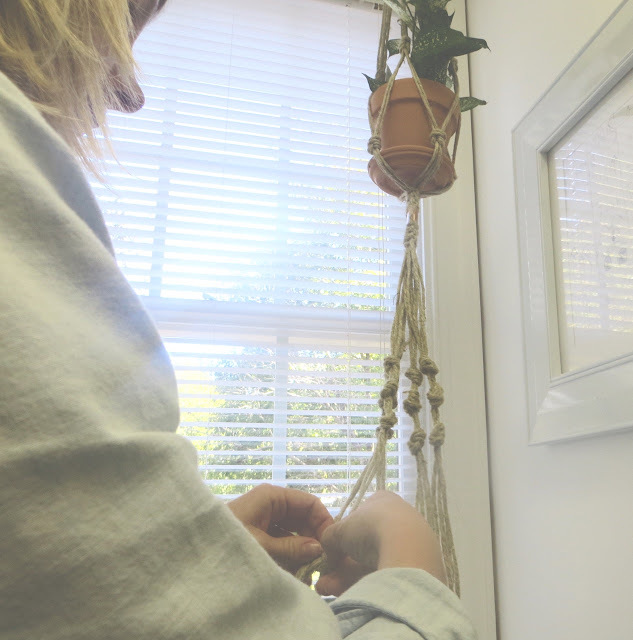 We have a window in our laundry room that gets the most sun and that gave me the idea to hang plants in front of it. Upon searching for “plant hangers” I discovered MACRAME! 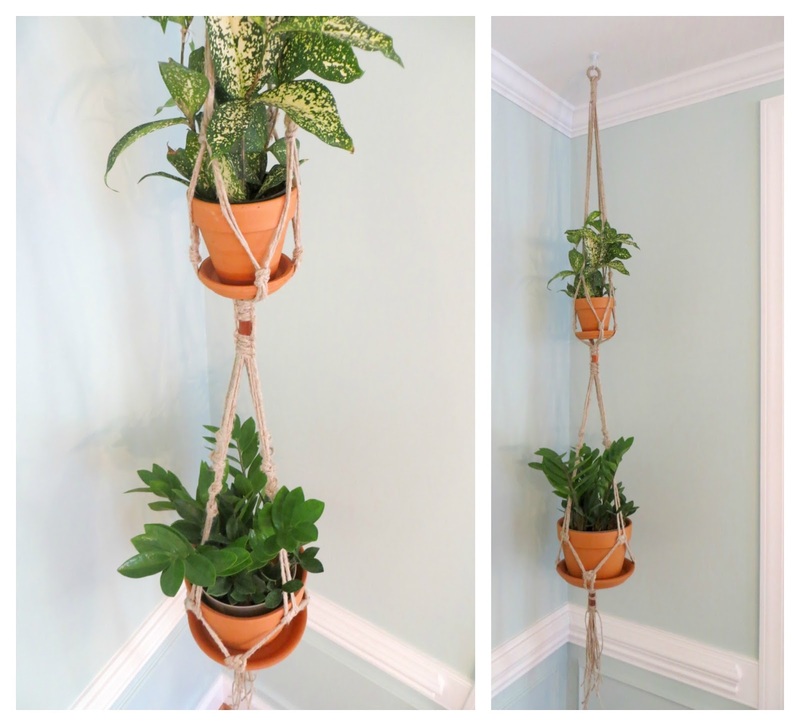 I was shocked that I had never seen (or maybe just haven’t noticed) these types of plant hangers before. 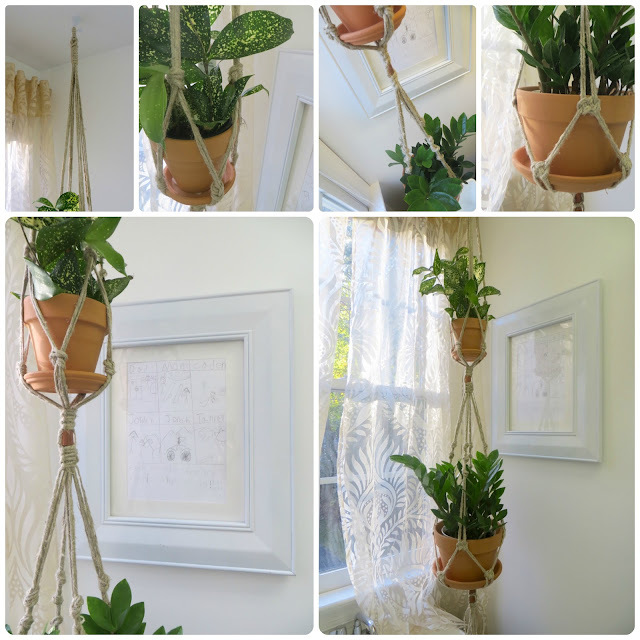 Macrame is basically knot tying with ropes or cords and if you want to know the history (click here)… I find it very interesting! After I made my first one for the laundry room I couldn’t help myself and I made another one to go in our formal dining room! Our laundry room hanger has a 4″ clay pot on the top and an 8″ pot on the bottom. The one for our dining room has only 4″ pots. One thing I’ve discovered is it takes trial and error to make your hanger just the right length you want and that you need to customize where you have the knots depending on what size pot you’re putting in but all in all it’s easier than you think! You just need to get your supplies and give it a go! Gather a yard stick, scissors and pots/plants to get started! I started out tying my first hanger on the floor but ended up holding it up so many times trying to balance the pot in my other hand to see how it would fit that I decided I needed to hang it in the spot where I was going to keep it – I highly recommend doing this! 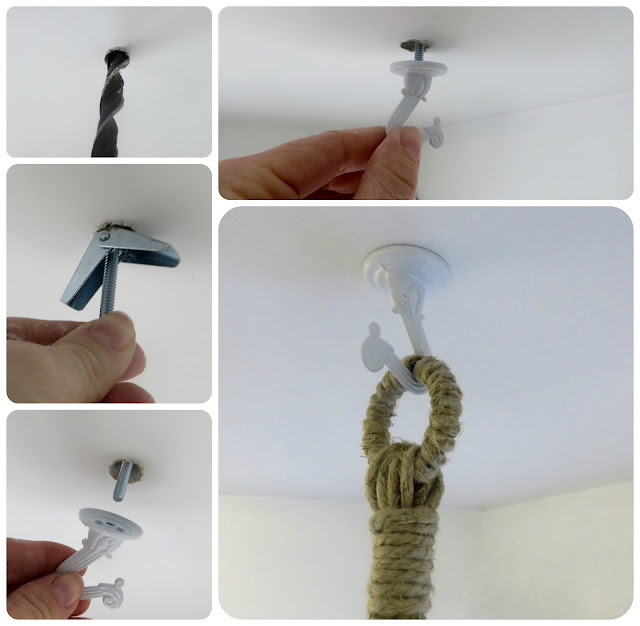 I was a little nervous drilling a 1/2″ hole into our ceiling but once the hook was on I decided I want to put these all over my house with pretty things hanging from them. I got these swag hooks in a package of 2 from Wal-Mart for about $3 and they’ll hold up to 30 lbs. If you’re drilling right into wood there’s a plain screw end you can use rather than the toggle bolt. First things first. Decide what kind of cord, rope or twine you’d like. The thinner the cording, the more likely you’ll want to increase the number of strands in each section. 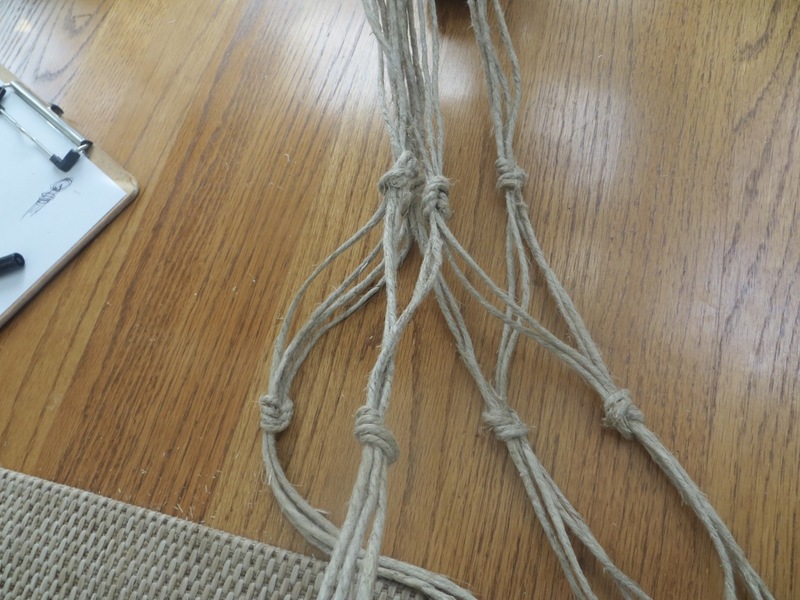 With thicker stuff (the top-center cording) you can get by with doing 2 strands per section). 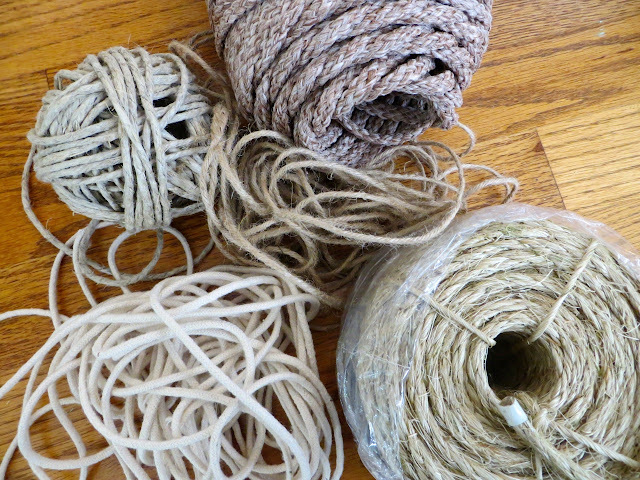 You can find cording/rope at hardware stores, Wal-Mart, craft stores or online! 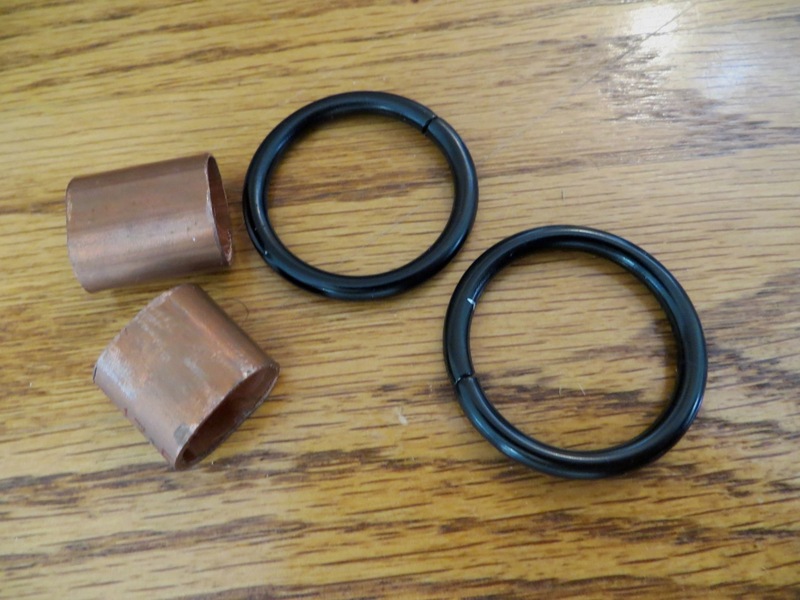 You can add embellishments such as beads but I chose to cut pieces of a copper pipe (and bent them oval shaped). For the rings that my hanger would hang from I used drapery rings and removed the clip part. You can get a package of 10 for less than $4 at Wal-Mart! 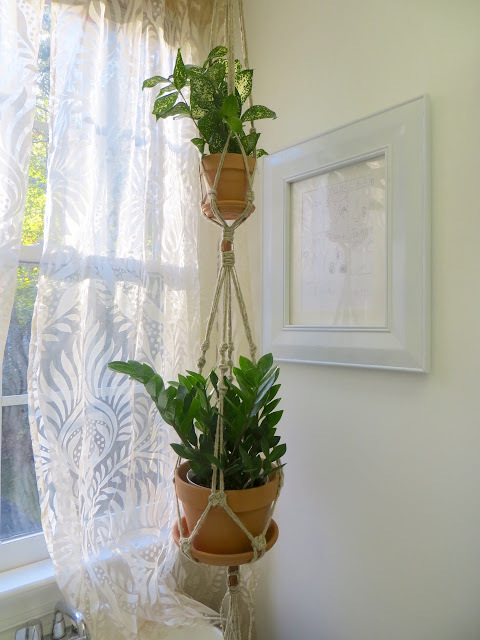 Most macrame hangers that I’ve seen have 4 main sections of cording with about 2-4 cords per section. 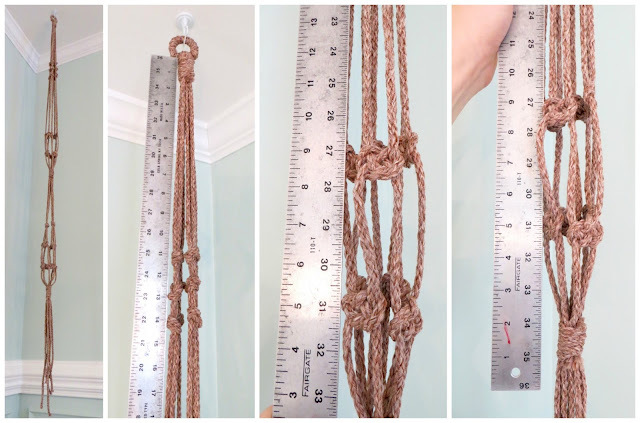 The length of your cords will be determined by how long you want your hanger plus the size of your pots plus how many knots you tie (the more intricate/detailed knots will obviously use more cording). For my laundry room hanger I used 4 strands of cord per section – meaning I’d be working with a total of 16 strands – so I cut 8 strands (they’re folded in half on the ring) about 6 yards long (better to cut longer than you think you’ll need)! My dining room hanger had a thicker cord so I used 2 strands per section – meaning I’d be working with 8 strands total – so I cut 4 strands about 5-1/2 yards long. You can keep your ring bare but I didn’t want it to stand out so I wrapped it with my cording. Next you’ll want to put all your cords through your ring until you reach the center of your cords. While holding your cords together use a separate cord to wrap tightly around. 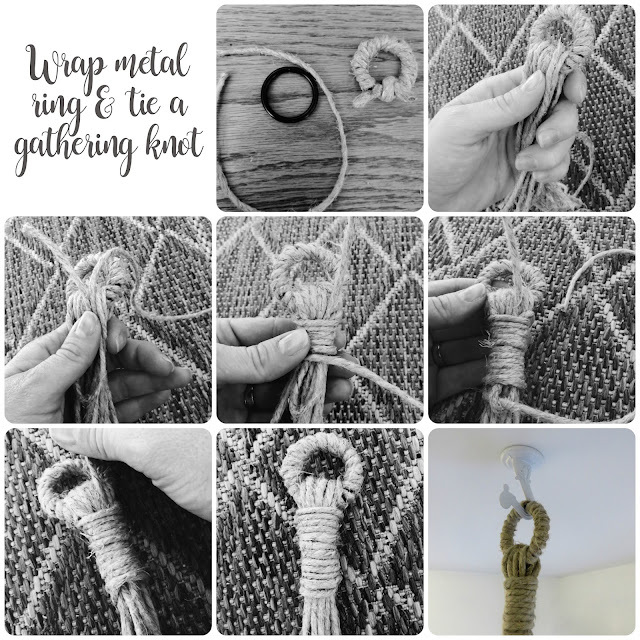 You’ll create a loop on one end over your bundle, wrap the other end around until you get the length of gathering knot you want. Put your last end through the loop and pull the ‘loop end’ so the last end gets pulled through your gathering knot. Trim ends and done! Disclaimer: I tied and untied parts of the bottom section of this hanger multiple times and there’s no hurt in that – at least I got it right in the end! I used only 3 types of knots for these hangers: a good ole’ simple regular knot, square knot and Josephine knot. Look at this diagram closely. 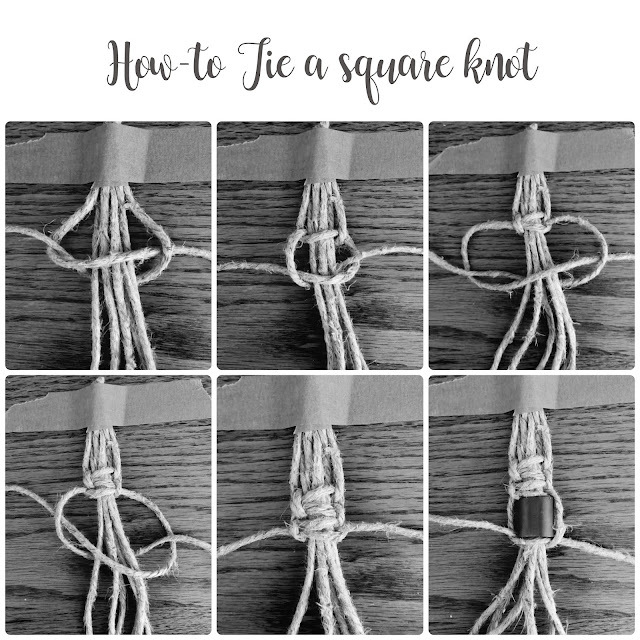 When tying square knots you alternate between the right and left strand going over the middle strands. If you do only one side over the strands each time it will create a spiral (which you may want – but not me)! A Jospehine knot looks complicated but after typing it a dozen times I didn’t have to even think about what I was doing. 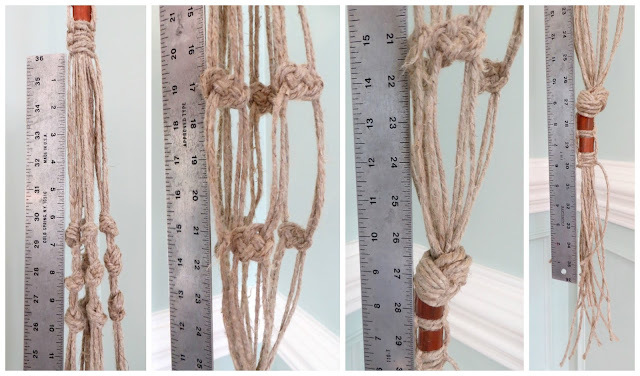 One thing to be sure of is to keep your strands in each ‘bundle’ flat to keep this knot looking it’s best. Also, pull on each cord end individually when tightening to snug everything together just right. I’m going to walk you through both hangers I made to tell you what knots I tied and where to maybe streamline the process for you. 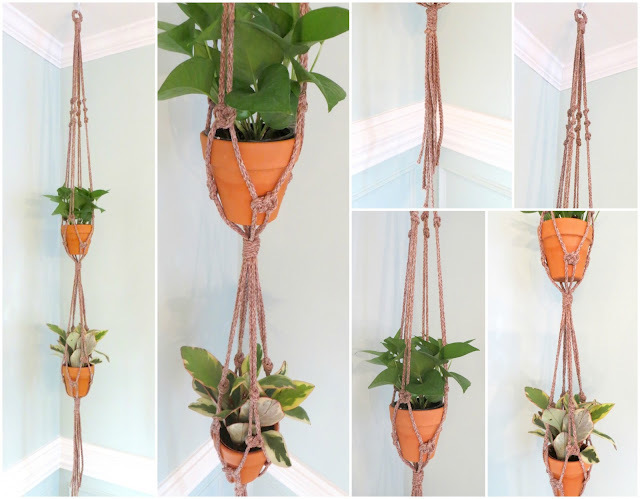 Be aware this is customized for a 4″ and 8″ pot – if your pots are different sizes you’ll want to play around with knot placement. Separate your cords into 4 sections. Measure from the base of your ring down 22-inches and tie a simple knot in each section. Break each section in half so 2 cords are going to each of it’s neighbor and tie a simple knot at 27-inches. Starting at 30.5-inches tie 6 square knots and add an embellishment in the middle if you desire. Separate your cords into 4 sections. Measuring from the base of your square knots, tie 3 simple knots at 6.5, 8 and 9.5-inches. Break each section in half so 2 cords are going to each of it’s neighbor and tie a Josephine knot at 17-inches. Tie the neighboring sections together again with a Josephine knot at 21-inches. Gather all cords together and tie one large knot at 27-inches. Tie square knots and add embellishments if you choose. I cut each cord with a staggering length so they didn’t end abruptly. Be aware this is customized for two 4″ pots – if your pots are different sizes you’ll want to play around with knot placement. Separate your cords into 4 sections. 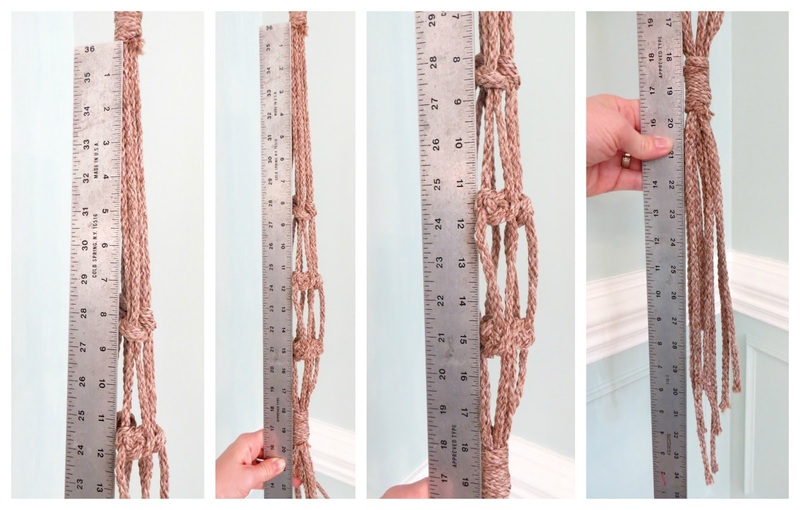 Measure from the base of your ring down 11-inches and tie a simple knot in each section. Tie another knot at 12.5 and 14-inches. Break each section in half so 2 cords are going to each of it’s neighbor and tie a Josephine knot at 27-inches. 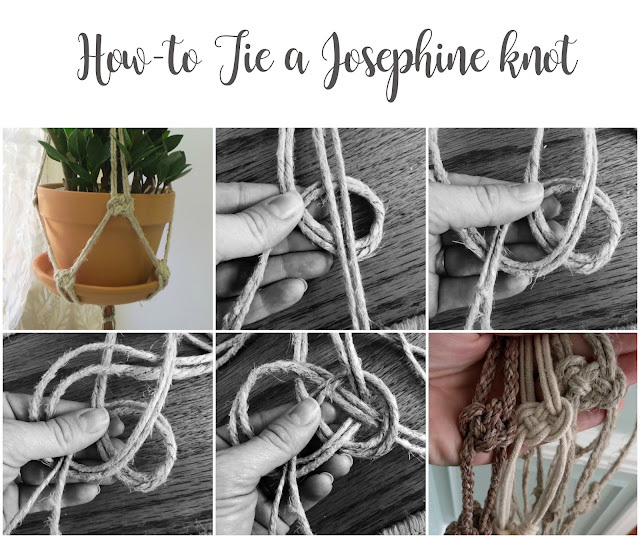 Tie the neighboring sections together again with a Josephine knot at 31-inches. Gather all cords together and tie a gathering knot with a separate cord starting at 34-inches. Separate your cords into 4 sections. 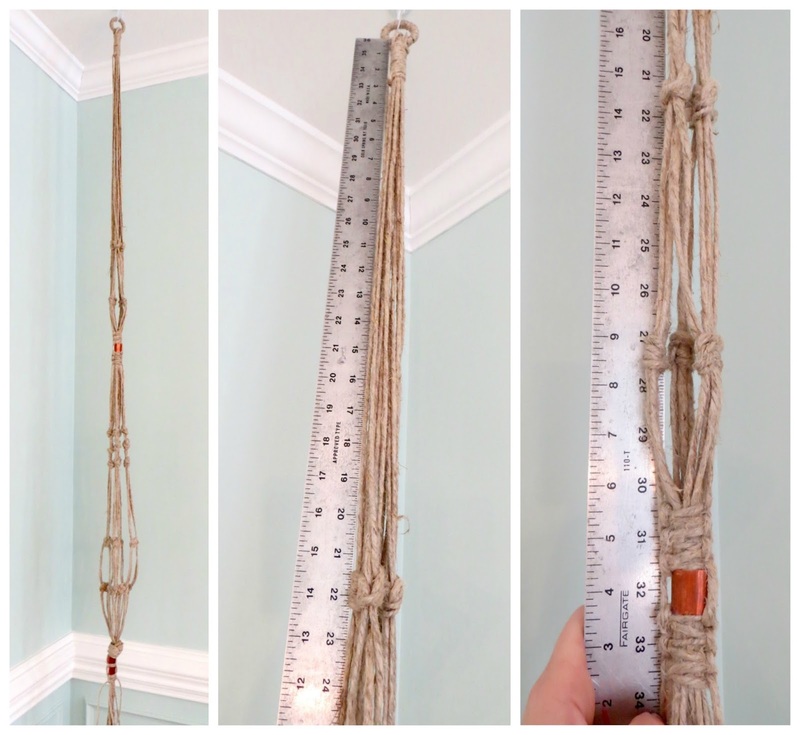 Measuring from the base of your gathering knot, tie a simple knot at 8.5-inches. Break each section in half so a cord is going to each of it’s neighbor and tie a Josephine knot at 11.5-inches. Tie the neighboring sections together again with a Josephine knot at 15-inches. Gather all cords together and tie a gathering knot starting at 18-inches with a separate cord. I cut each cord with a staggering length so they didn’t end abruptly. 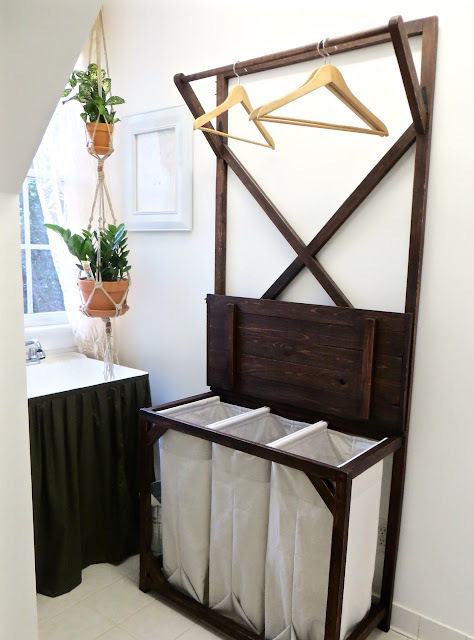 I fixed up our laundry room complete with a pleated skirt for the sink (my kids thought that was funny), curtains, picture frames (each of the 4 boys have their own to put whatever they want in it) and I made the laundry hamper (next post… stay tuned)!